Napolenica is special, especially as a cycling trip. You can basically belay, while sitting on your bicycle. The reason for this is, that the climbing area is directly next to an old large road, which is luckily not open for traffic any more. It also offers fantastic views over Triest and the Mediterranean Sea. Negative points are that lots of routes are chipped and there is no campsite close by. Climbing directly next to the old road, which is closed for traffic. Rock and routes: The wall is mostly vertical to slightly overhanging and the rock is a very solid limestone. Most routes are rather short. Several routes are highly chipped or even completely ‘manufactured’. Climbing area and environment: The climbing area is directly on an old road, which is closed for traffic nowadays. 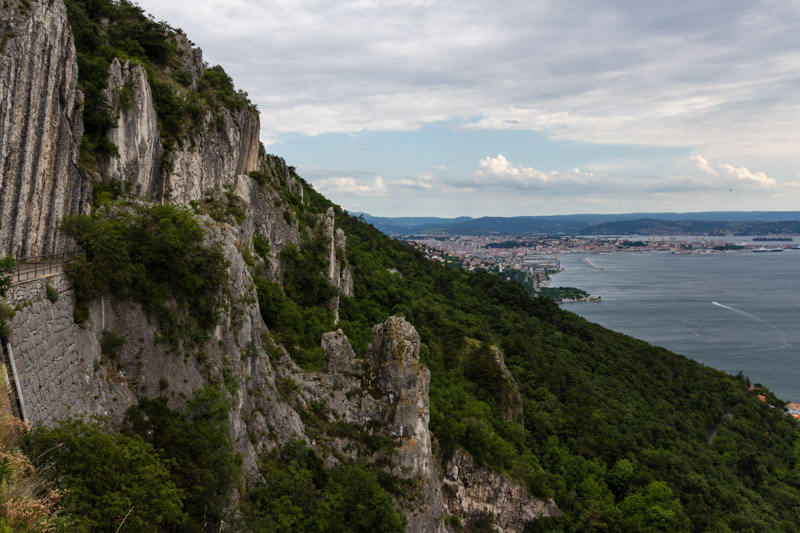 As the area is rather high up, the view to the Adriatic coast and the city of Triest is fanatastic. Guide book and information: There are several guidebooks for this area, but we used the amazing guidebook ‘Kraški Rob / Karst Edge’ by Jurij Ravnik. This is probably the best guidebook we have ever seen (see climbing Osp for more details). Lots of choices between French grade 4 and 7, directly next to each other, which makes it a perfect area for the entire family. The wall is south facing and it gets too hot in summer. Best in autumn to spring. There is also not much shade around. 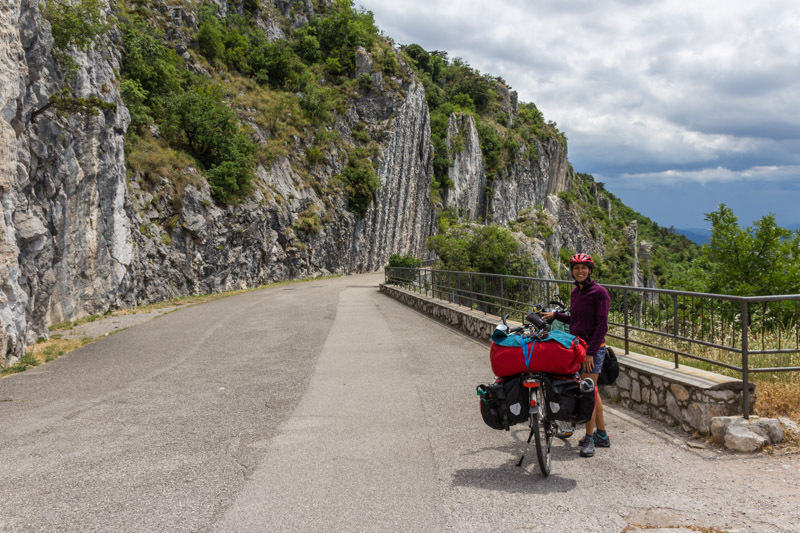 Climbing Napolenica – perfectly accessible by bicycle, but also long ride up. Accommodation: Unfortunately, there is no campsite close by. So we stayed at the campsite ‘Camping Village Mare Pineta’ (www.marepineta.com), which is about 15 km away from Napolenica. The campsite was clearly not our favourite and rather expensive with 27€ for two person. We went to Napolenica on our way to Triest. Access to food: There is a small village ‘Prosecco’, which has a small supermarket with basic food. Access to water: No problem, as there is access to fresh water directly at the climbing crag. Access by bike: The access by bike is rather difficult and also simple at the same time. As the area is rather high up at about 350m, it is a long cycling climb to the climbing area. 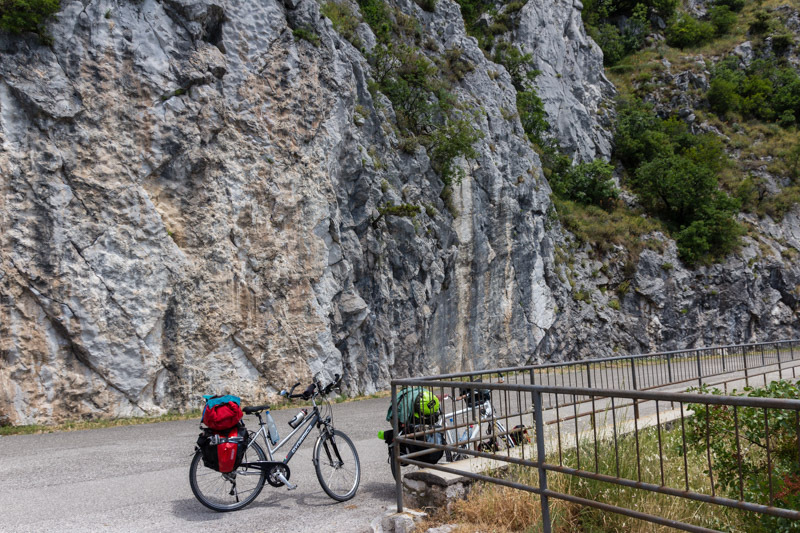 The good side is, that the old road is situated directly at the wall, so it is possible to jump from the bicycle directly on the rock. Fantastic view from the climbing area Napolenica down to Triest.